Smartphones are developing and updating very fast, sometimes it is quite confusing for users to pick a suitable smartphone at the right budget. For smartphones around $100, what do you expect on its performance, camera effect and design? 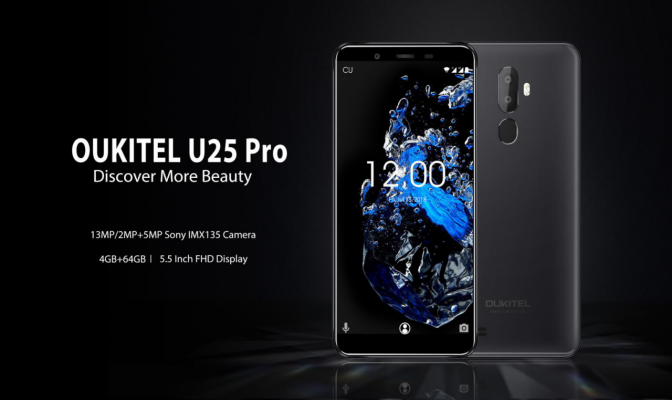 Here comes the OUKITEL U25 Pro with price of just $100, beautiful design and good performance. The U25 Pro features a 5.5 inch FHD display with LG LCD display and Asahi glass cover, the FHD display with 1920×1080 resolution displays vivid and bright colors to all APPs and photos. U25 Pro screen is 2.5D curved while the back is ergonomic design to fit human hand perfectly. The main frame adopts Aluminum titanium alloy and the whole device is quite slim and thin, making it quite beautiful and comfortable to hold in hand. U25 Pro will pack a 3200mAh battery, though not as big as the K series smartphones of OUKITEL, it is enough to support a whole day use. U25 Pro will take a Type-C USB port for easier plug in and out. U25 Pro is definitely a mid-ranger, but is anticipated to perform well in handling daily life tasks. It is fueled by MediaTek MT6750T octa-core processor clocked at 1.5Ghz, taking a 4GB RAM and 64GB ROM, together with Android 8.1 to offer stable and fluent handling performance. In camera, it will take 13MP Sony IMX135 sensor with a 2MP auxiliary camera for a bokeh effect. The front camera is 5MP with GC5025 sensor for selfies.